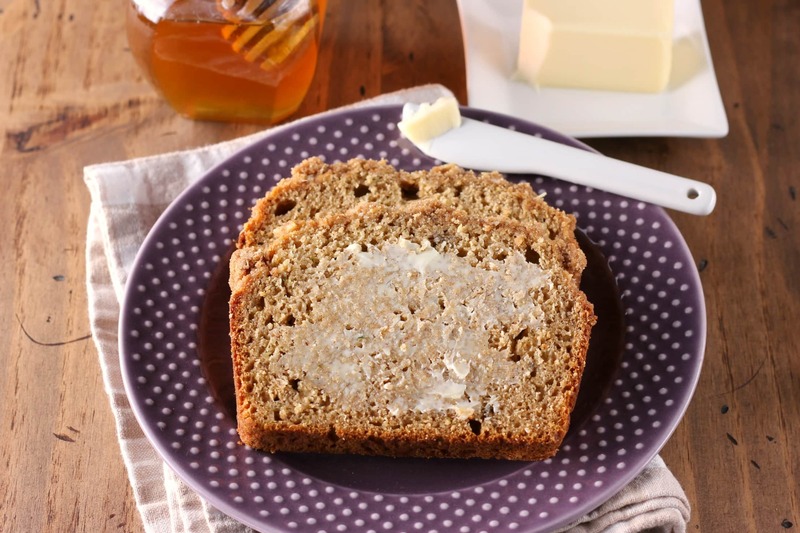 This easy Cinnamon Streusel Zucchini Banana Bread is a mash up of the classic favorites banana bread and zucchini bread! Topping it off is a rich, buttery cinnamon streusel! Put those overripe bananas and abundant zucchini to good use! We’re firmly in the middle of zucchini season around here. We’ve been grilling it, making zoodles, and, of course, baking with it! Last year we made a zucchini carrot cake bread (complete with a cream cheese frosting!) that quickly became a favorite! When I went into the kitchen to use up a zucchini that we had picked awhile ago, I had every intention of making another loaf. And then I saw two very sad bananas sitting on the counter. So my plans changed and I decided to make a zucchini banana bread! I looked at a couple of my banana bread recipes and ended up taking my carrot cake banana bread and switching up the spices and swapping out the shredded carrot for shredded zucchini. I also left off the cream cheese frosting and added a crumb topping from these blackberry raspberry coffee cake muffins. The result of the mashup of these recipes ended up in this cinnamon streusel zucchini banana bread! 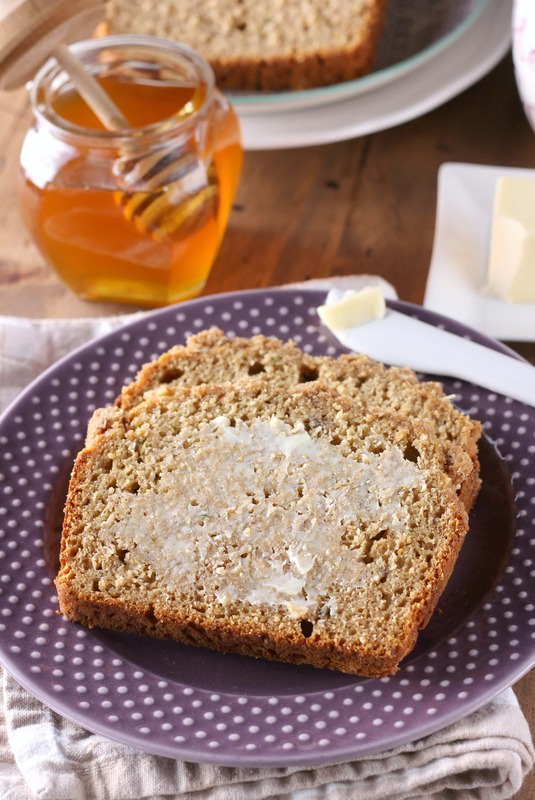 An easy quick bread recipe filled with warm spices and loaded with moisture from shredded zucchini and bananas. Oh, and did I mention the crumb topping? 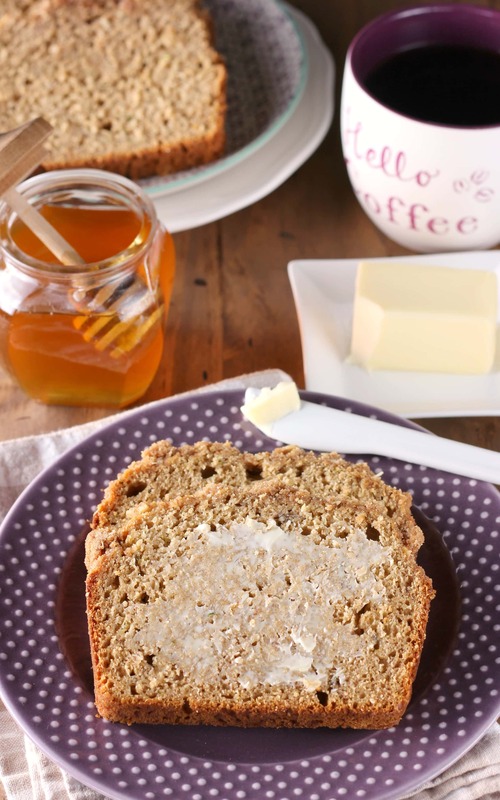 Streusel is always a good addition to quick bread! Cut a couple of thick slices for breakfast or grab a slice for an afternoon snack! Preheat oven to 350. Spray a 9x5 inch loaf pan with non-stick cooking spray. In a large bowl, whisk together flour, baking powder, baking soda, salt, cinnamon, and nutmeg. In a medium bowl, whisk together banana, yogurt, honey, olive oil, eggs, and vanilla extract. Add wet ingredients to dry ingredients and stir until just combined. Stir in shredded zucchini. In a small bowl, whisk together flour, brown sugar, oats, and cinnamon. Cut in butter until mixture resembles coarse crumbs. Spread over the batter and gently press down. Bake for 40-50 minutes, or until toothpick inserted in the center comes mostly out clean. To prevent top from getting too brown, you may want to cover loosely with aluminum foil after 25 minutes. 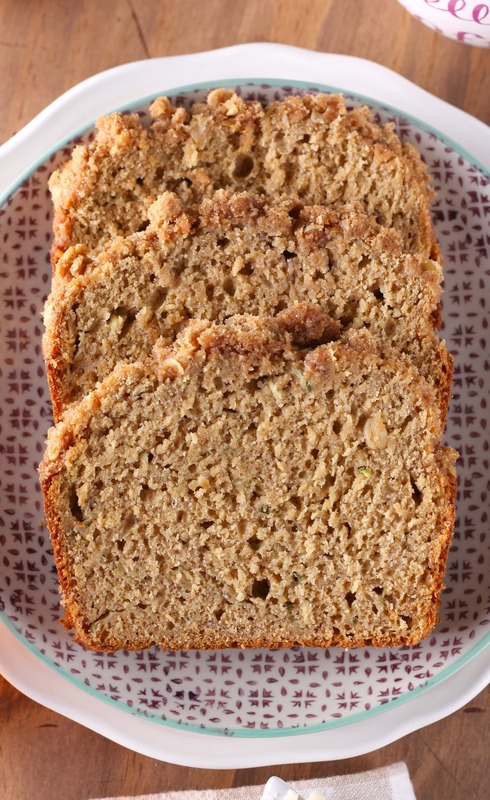 This combines three of my favorite things: zucchini bread, banana bread, and STREUSEL TOPPINGS! I need to try it asap!